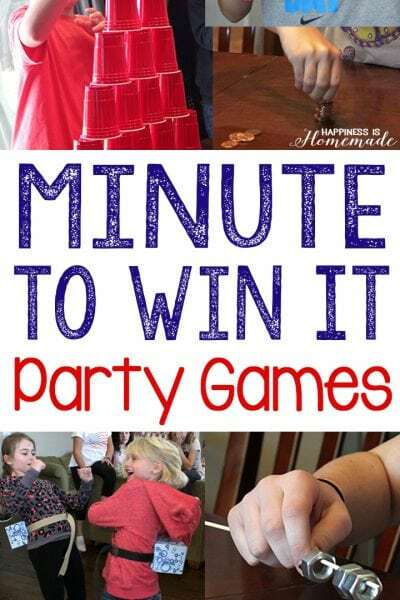 Looking for Valentine games for your Valentine’s Day party? 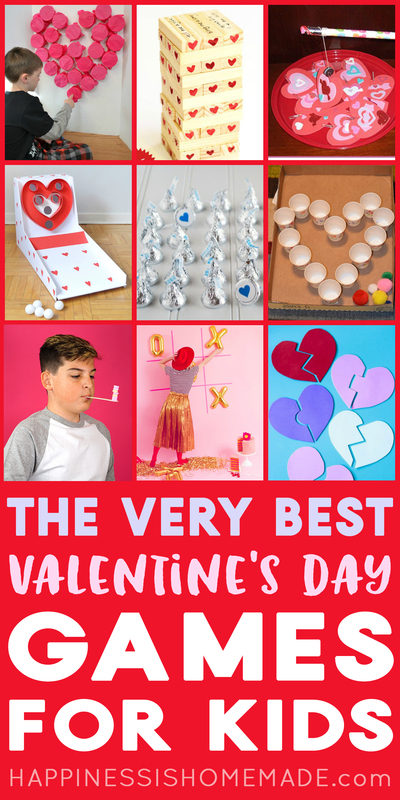 We’ve got you covered with 30+ super fun Valentines games for kids! 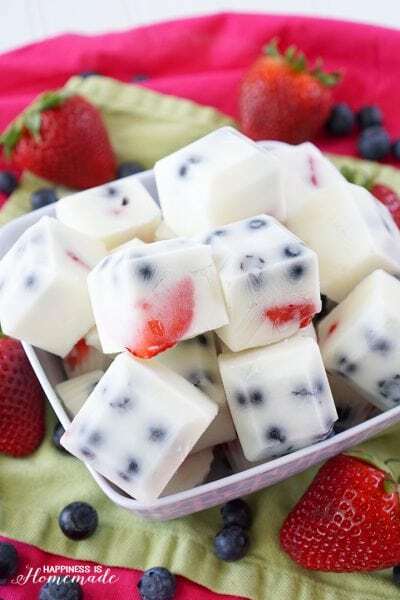 Perfect for class parties, Scouts, playgroups, and more! 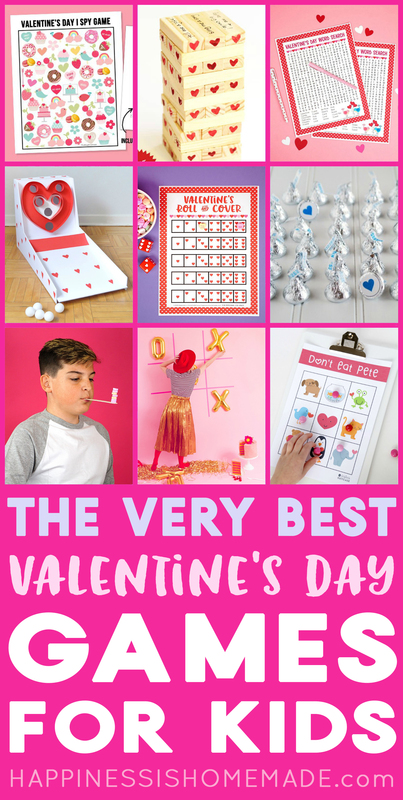 Valentine’s Day is just around the corner, so we put together a list of the BEST and most fun Valentines games for kids of all ages! (Honestly, I think that most adults would enjoy a large portion of these games as well, so they’re great for mixed-age groups!) 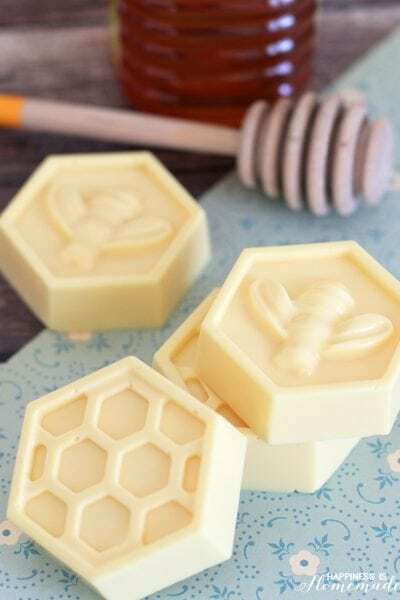 Perfect for classroom Valentine parties, Scout meetings, playgroups, homeschool meetups, family game night, and SO much more! 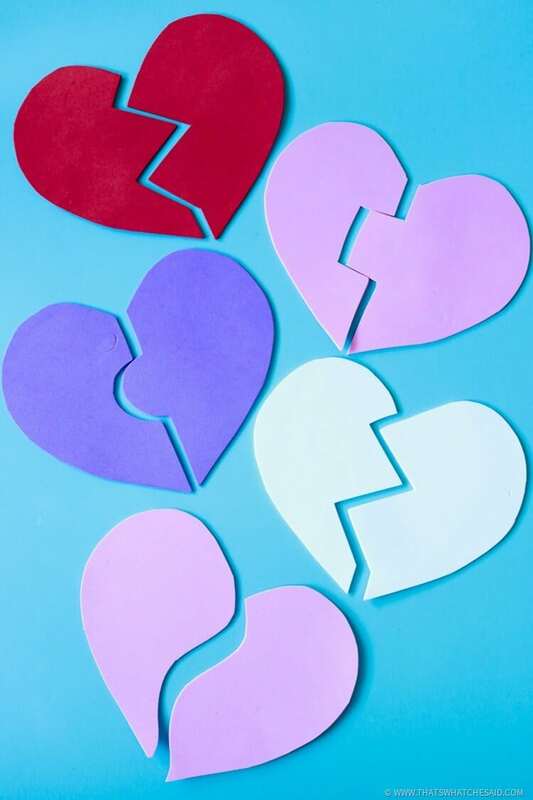 We broke down our list of games into two different sections – printable Valentine’s Day games and active games that will get everyone out of their seat and moving around. Both are fantastic depending on your situation and needs, so scroll around for awhile – I’m sure you’ll find something you’ll love! 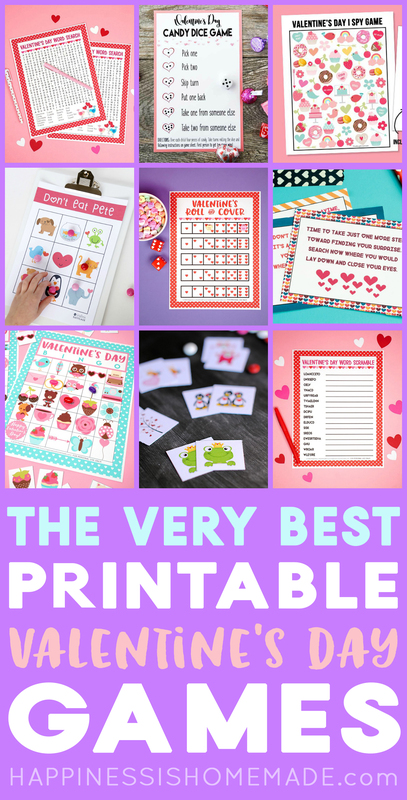 Printable games are my #1 favorite because they’re ready-to-go and easy to use – simply print and play! 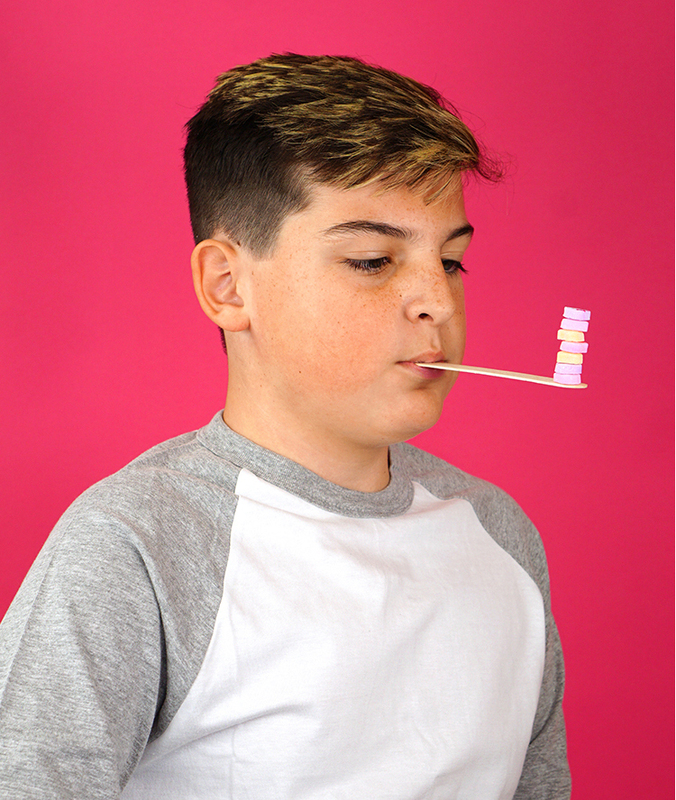 Most of these games don’t require any additional supplies other than perhaps a pencil or some candy hearts to use as game markers. You can’t get much easier than that! 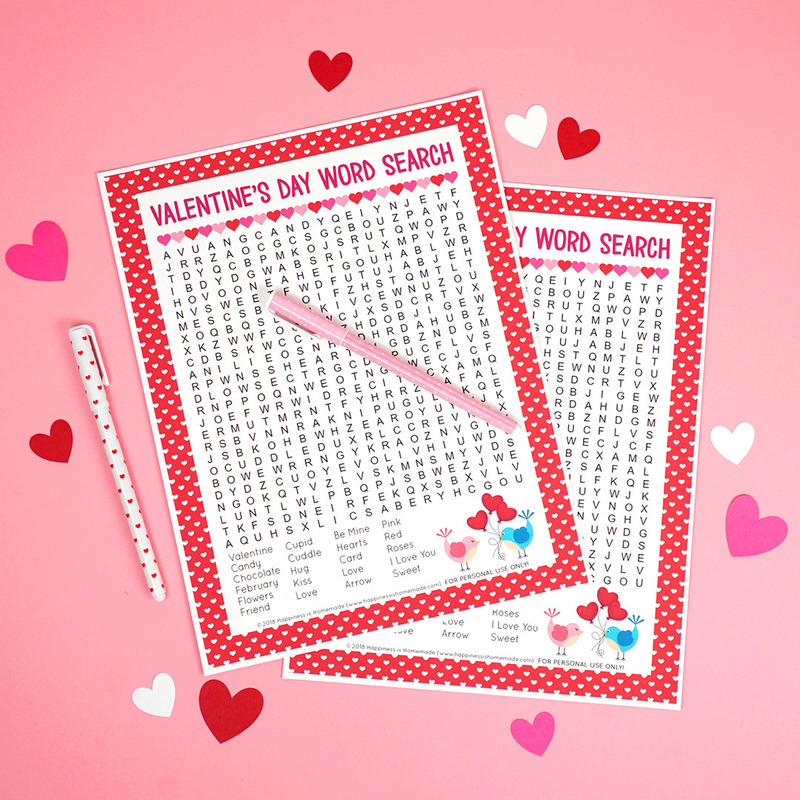 Everyone loves a good word search, and this cute printable Valentine’s Day Word Search includes a fantastic mix of long and short words, so it’s great for both kids and adults alike! 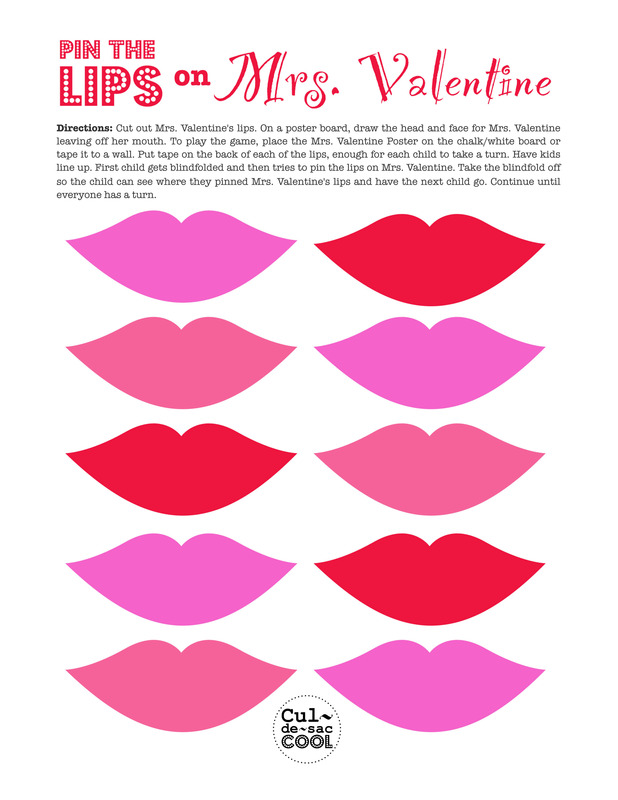 Pin the Lips on Mrs. Valentine in this fun Valentine’s Day twist on the classic pin the tail on the donkey game! 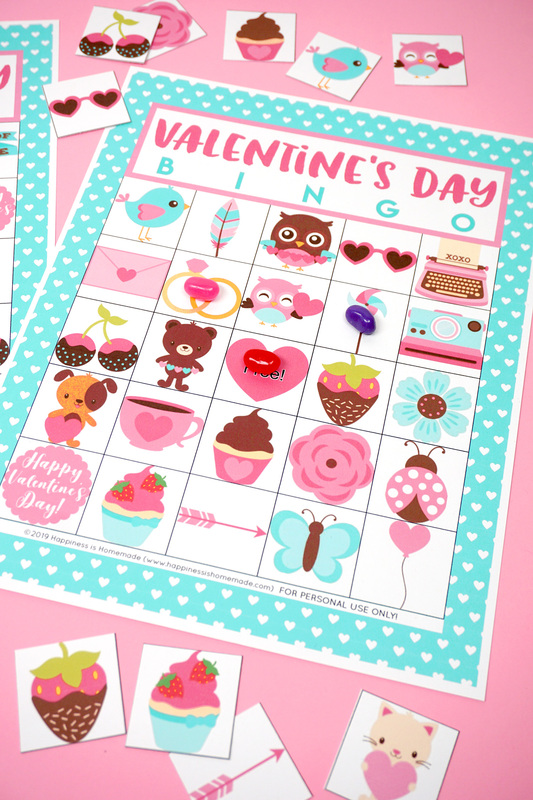 Valentine’s Day Bingo is a fun game that’s perfect for classrooms and groups of all ages! 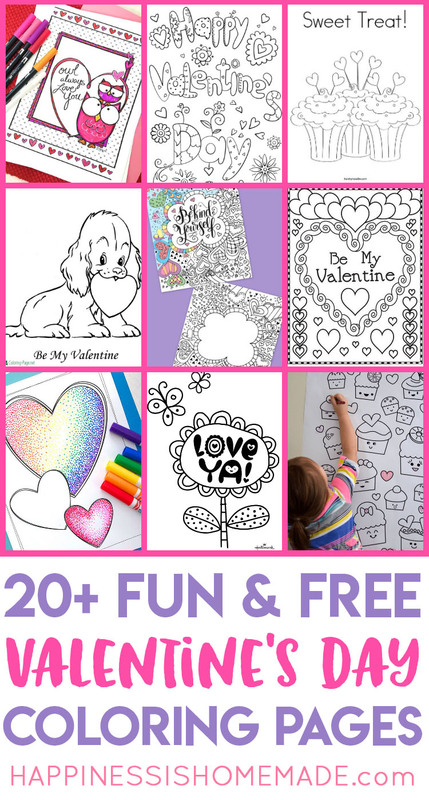 This printable Valentines bingo game comes with 30 different calling cards, so it can be used to play both traditional bingo and blackout bingo. This game uses images instead of text for the bingo boxes, so even the littlest of kids can play along! 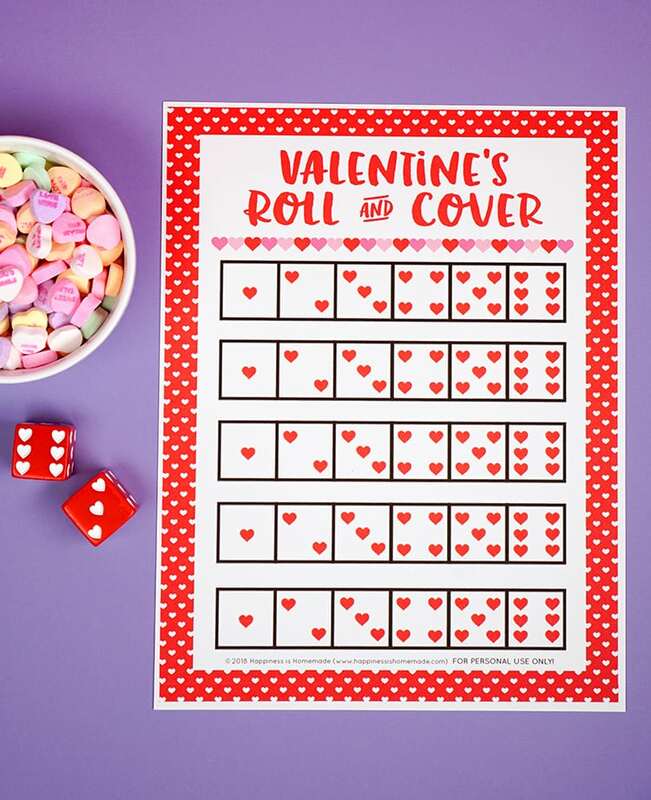 This Valentine’s Day Roll & Cover game is a TON of fast-paced fun that will have everyone in giggles! 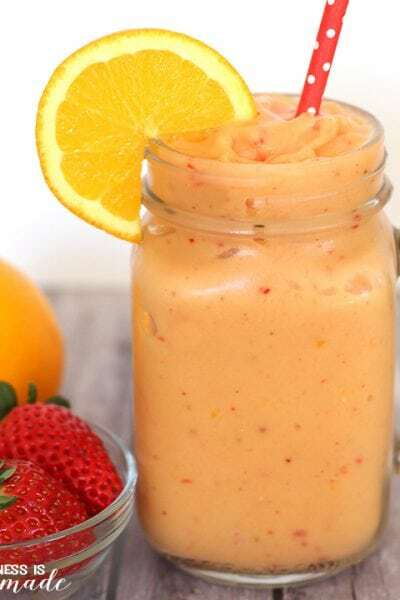 Get the free printable and instructions here! 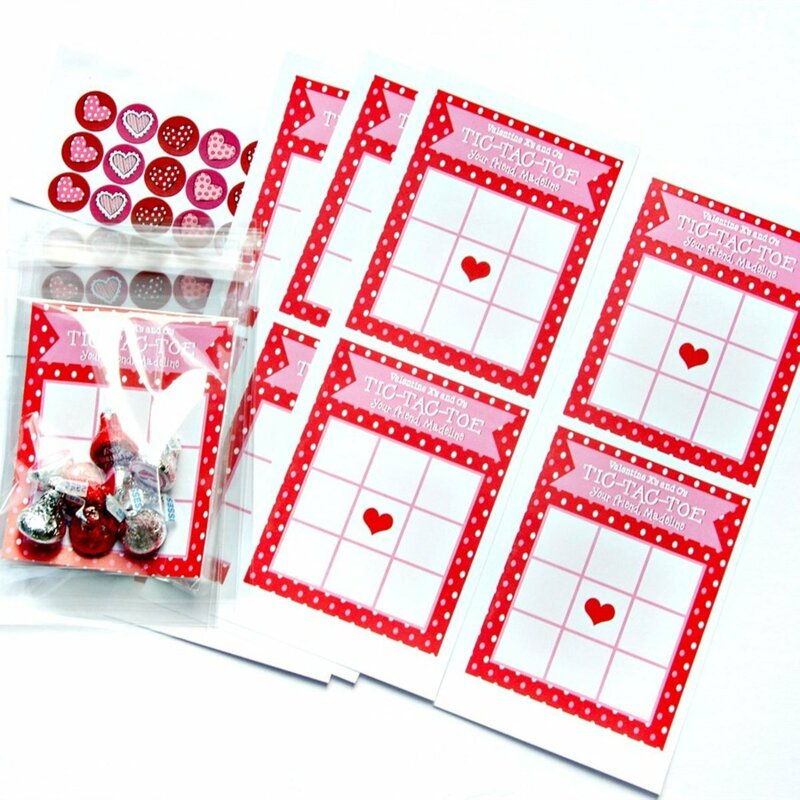 These adorable Valentine’s Day Tic Tac Toe cards do double duty as a both fun game to play AND cute Valentines cards to share with your friends! 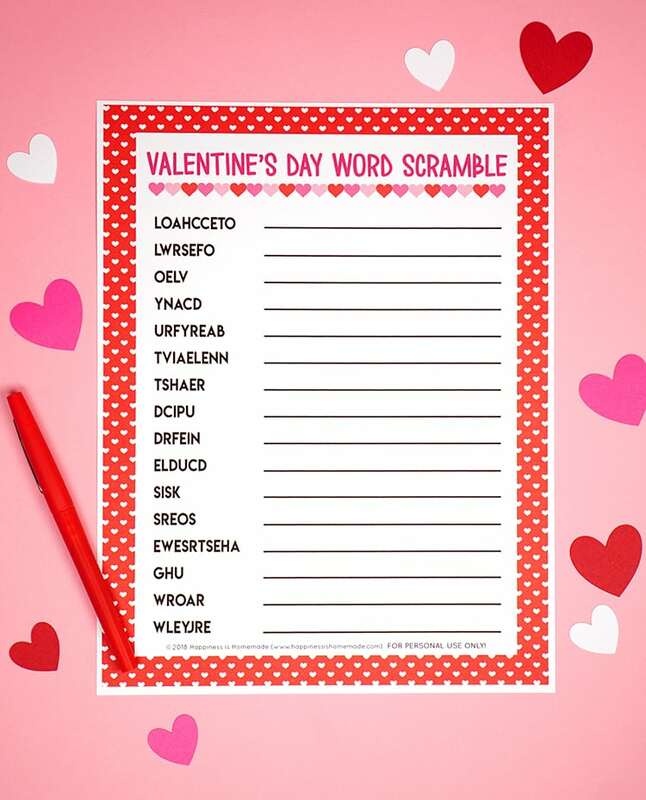 Word scrambles are one of my kids’ favorite games to play, and this Valentine’s Day Word Scramble is right up their alley! 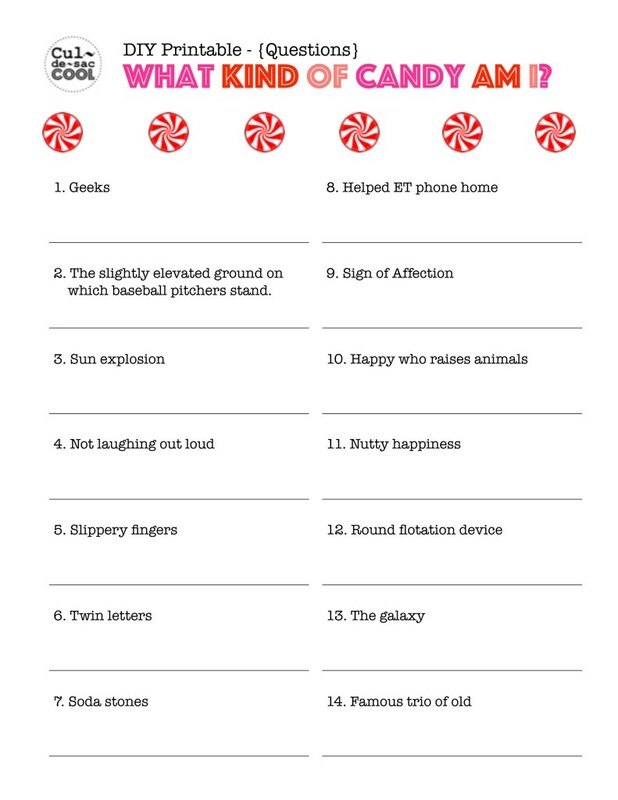 There are sixteen mixed-up holiday words (in varying lengths so it’s great for all ages!) just waiting to be put in the proper order! 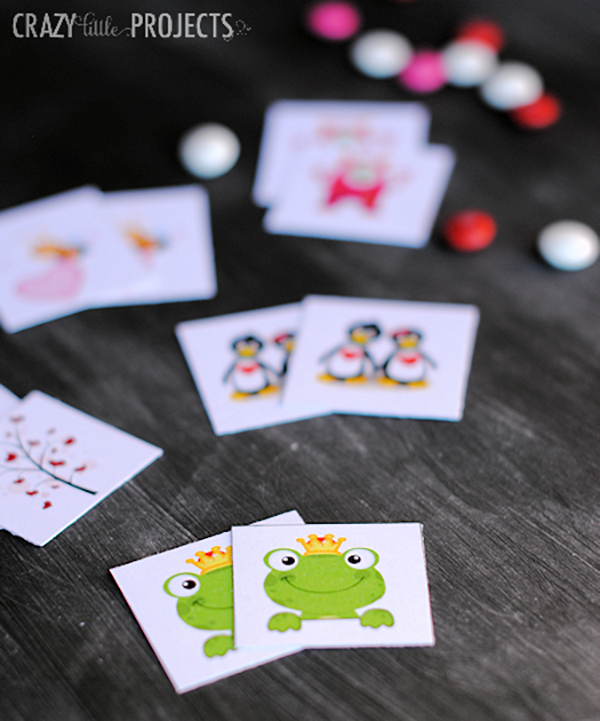 Memory match is a great game for younger children, and this Valentine’s Day Memory Match Game is super cute! 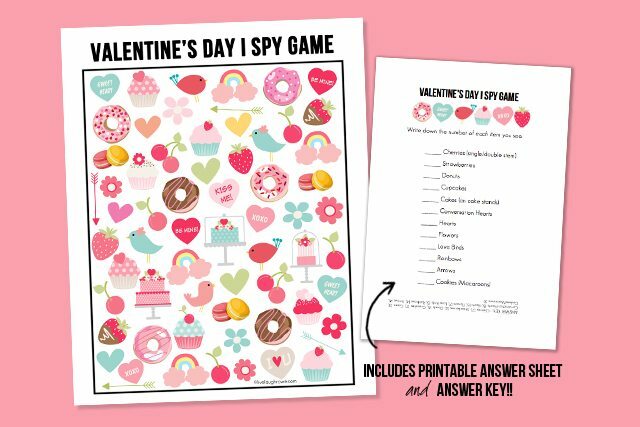 Valentine’s Day I Spy is a fun game for all ages – to make it more challenging for older kids, set a timer and race to answer the questions before time runs out! This Alphabet and Number Matching Game is both fun and educational for younger kids! 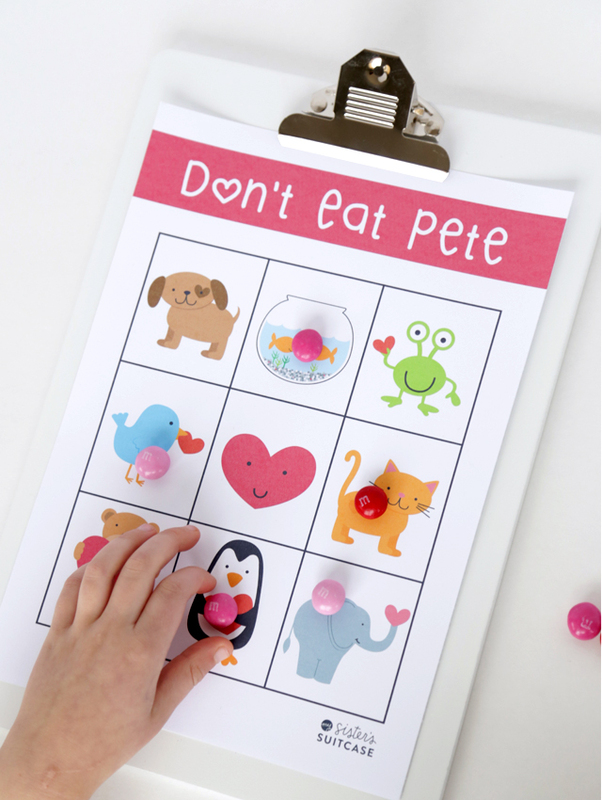 This printable Don’t Eat Pete game is a great game for classroom Valentine’s Day parties! If you haven’t played HedBanz yet, you’re missing out! It’s a super fun guessing game that can be played by the whole family. 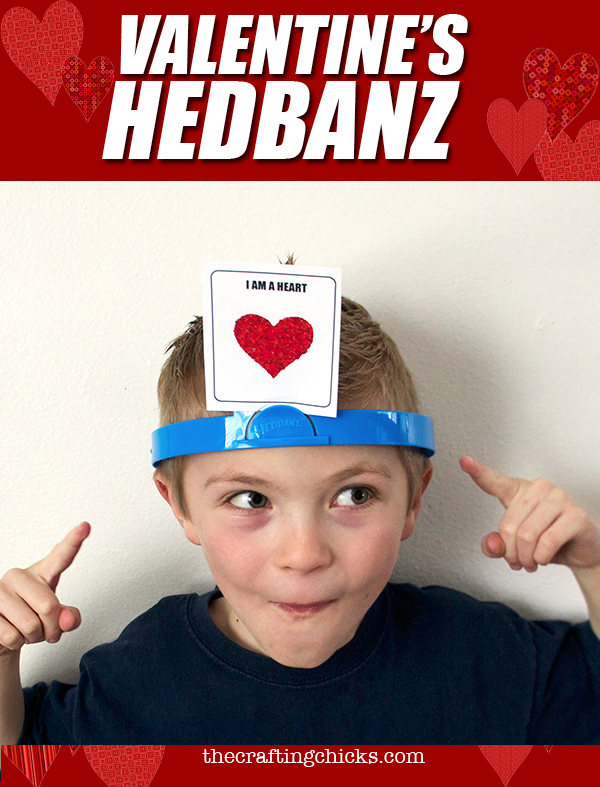 Grab this printable Valentine HedBanz Game and laugh yourselves silly! 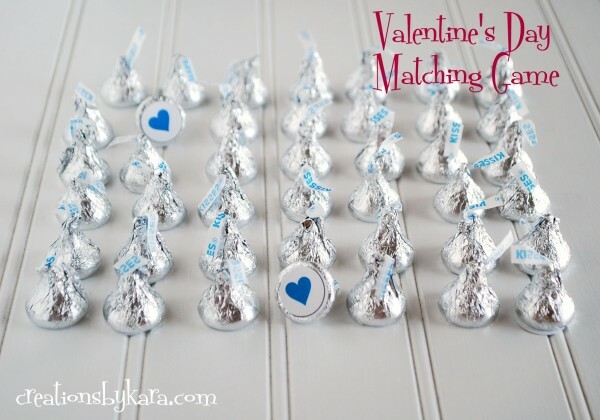 Add an even sweeter twist to the match game with this Hershey’s Kisses Matching Game! 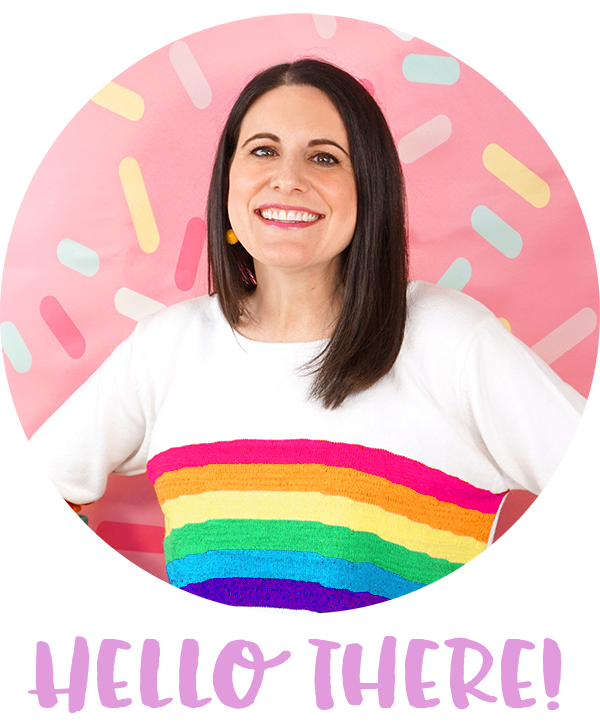 Older kids and adults will get a kick out of this fun “What Kind of Candy Am I?” printable Valentine game! 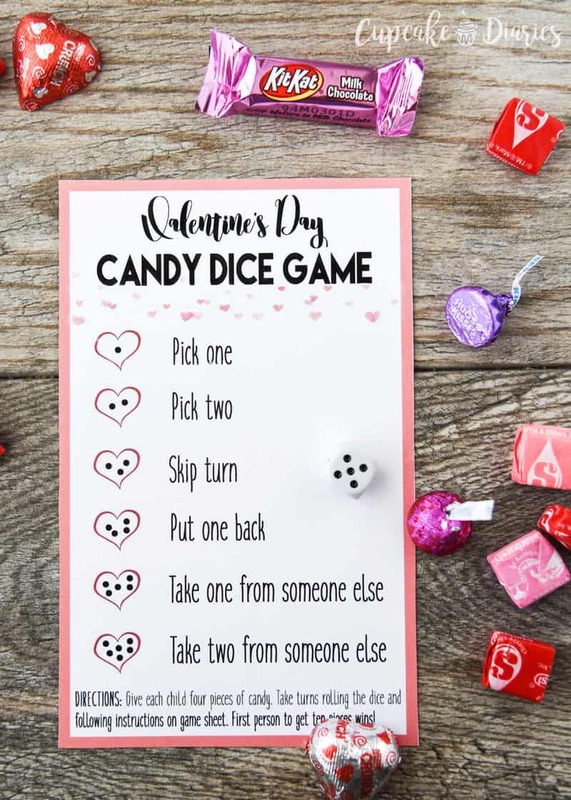 This Valentine’s Day Candy Dice Game is always a favorite! Great for classrooms and groups! 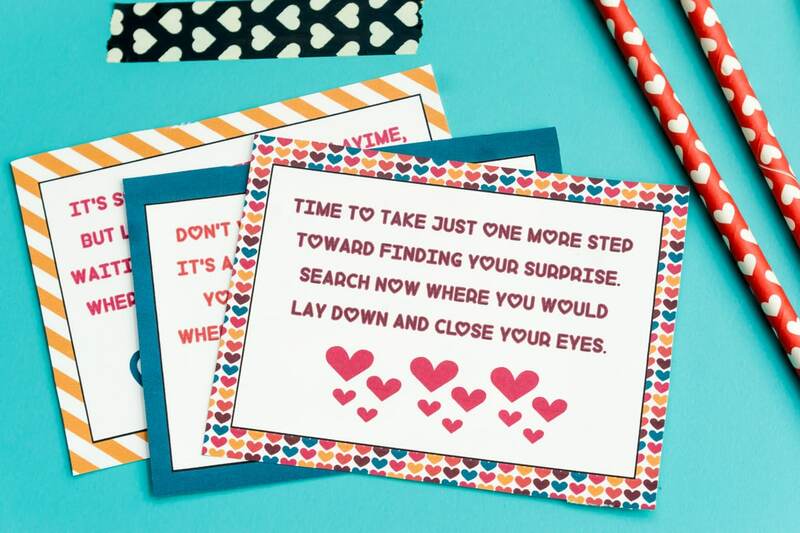 Lead your loved ones on a fun treasure hunt with this Valentine Scavenger Hunt game! These active games are perfect for classrooms and groups! 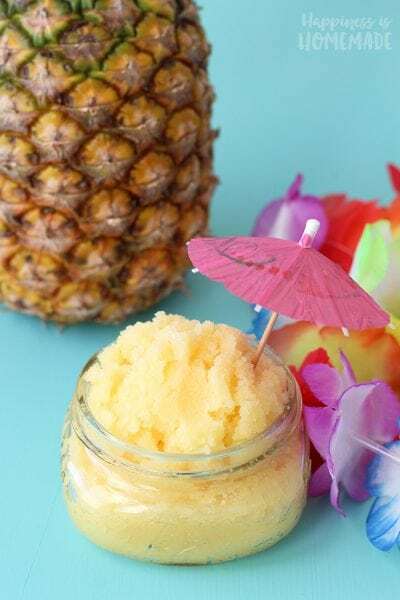 Get everyone out of their seats and moving around with these fun games that are awesome for ALL ages (even adults will want to join in on the fun with many of these!)! 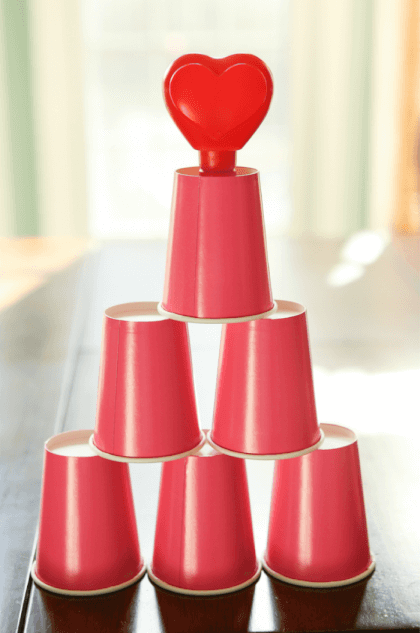 Heart-a-Stack is just one of 11 SUPER fun Valentine’s Day Minute to Win It Games that are fun for all ages – check them all out here! 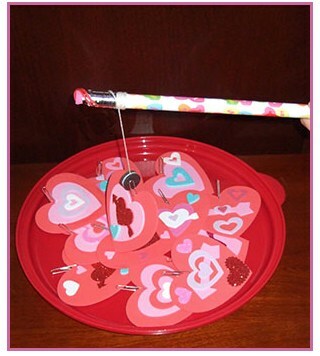 This “My Heart is Bursting” Valentine punch game would make an awesome Valentine’s Day party or classroom activity! Fill the cups with a fun treat and let each child chose a cup to punch! 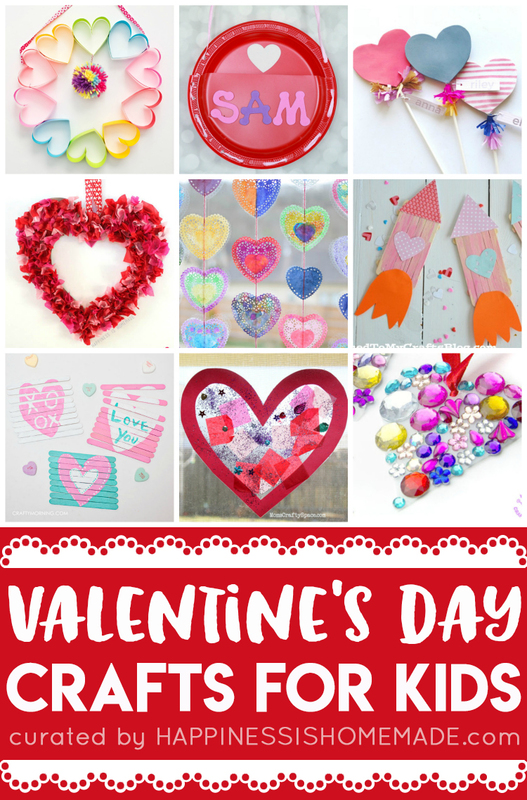 All it takes is craft foam to create this easy Preschool Valentine Match Game that’s tons of fun for younger kids! 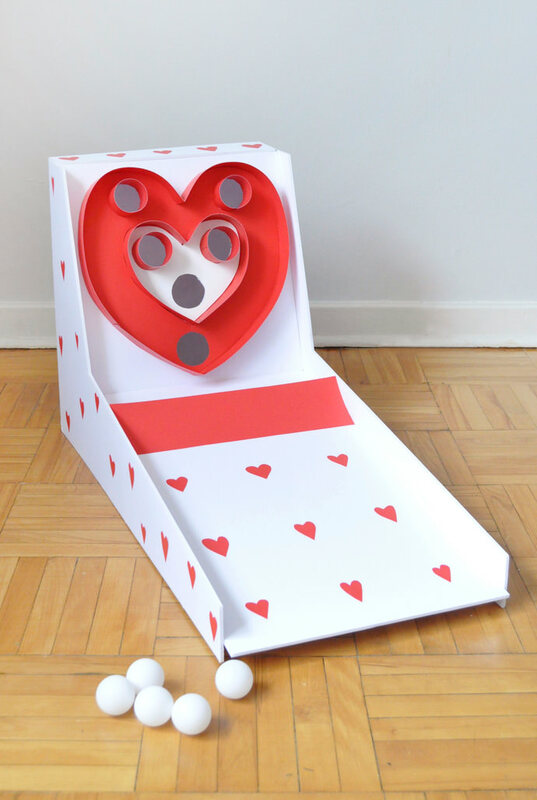 Skeeball is my favorite carnival game, so I’m head over heels for this adorable DIY Valentine’s Day Skeeball game! 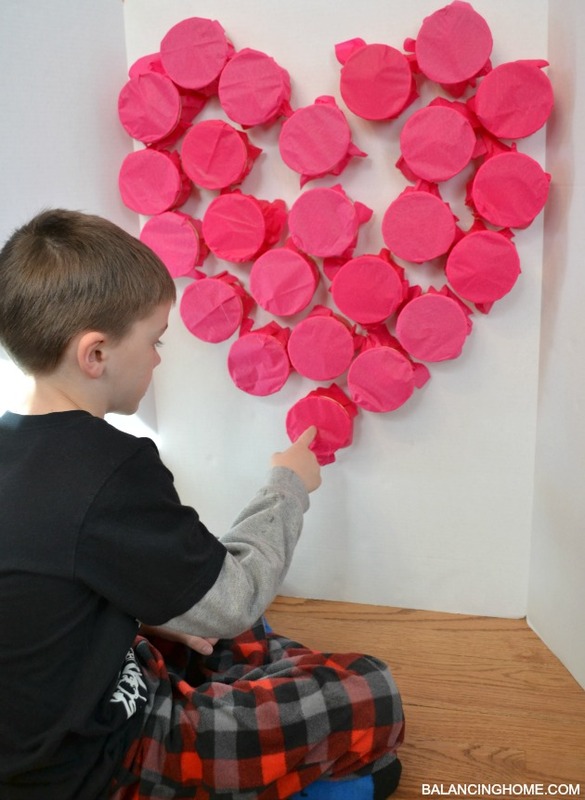 Looking for a Valentine’s Day game that will get your kids up, moving, and using their brains? 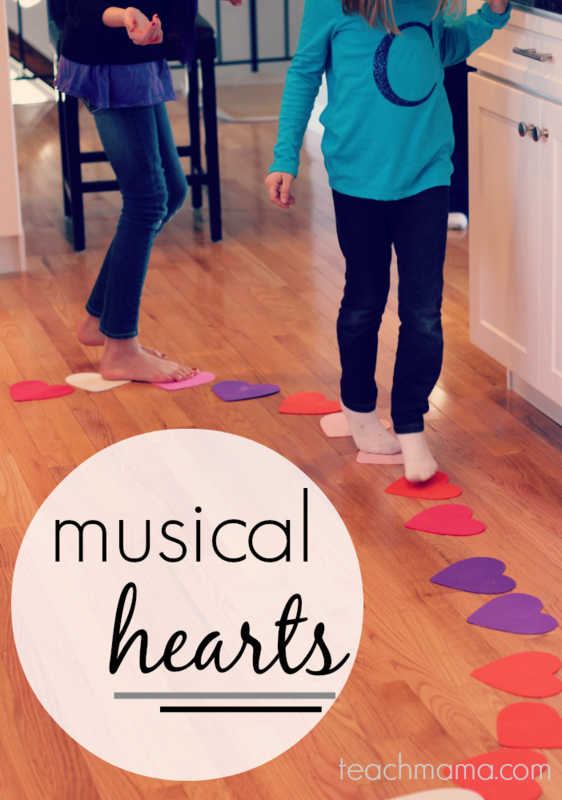 Musical Hearts is just the thing you’re looking for! 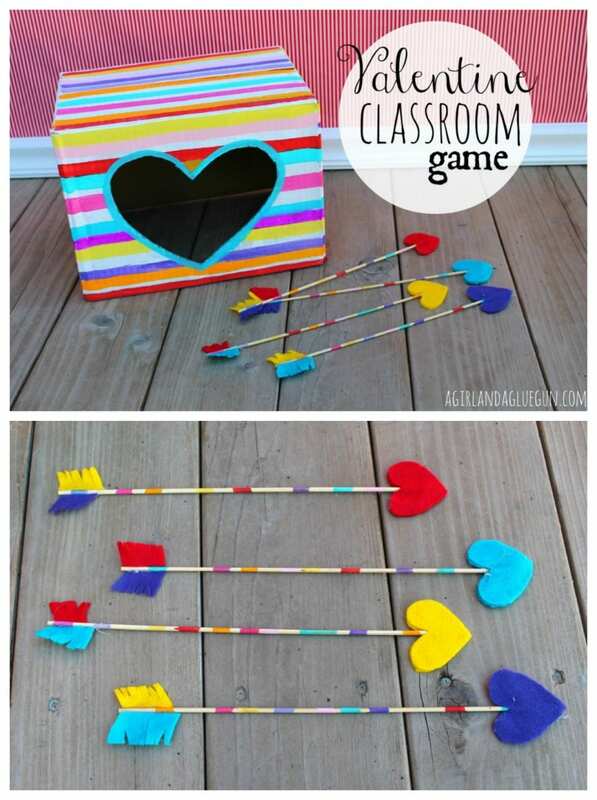 This easy Valentine’s Day Arrow Game uses a recycled cardboard box as a target and will keep kids of all ages entertained! 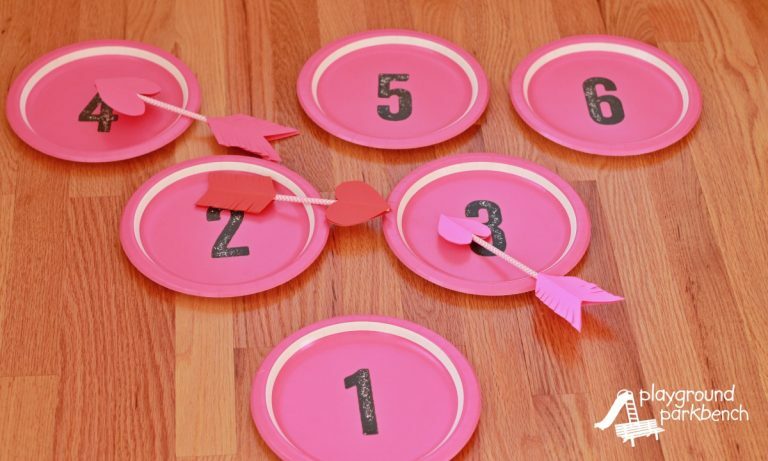 This cute Cupid’s Arrow Game is similar to the arrow toss game above, but it uses paper plates to make quick and easy scoring targets. Fun! 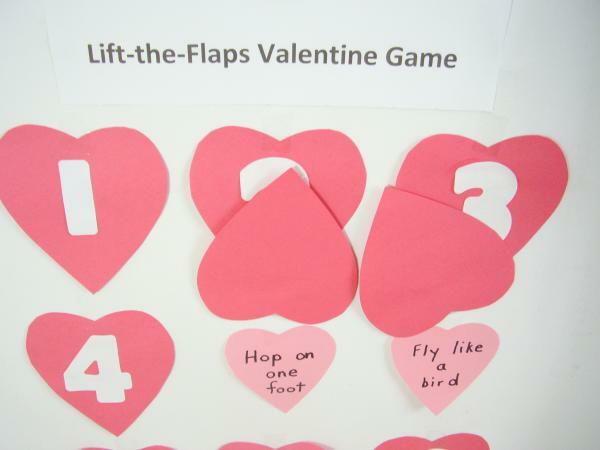 This adorable Valentine’s Day Tumble Game is fun for the whole family! 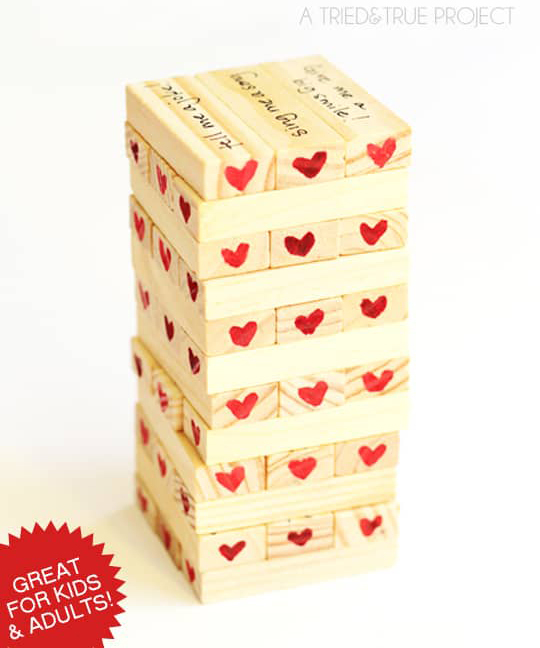 It’s similar to classic Jenga, but with a super sweet Valentines twist! 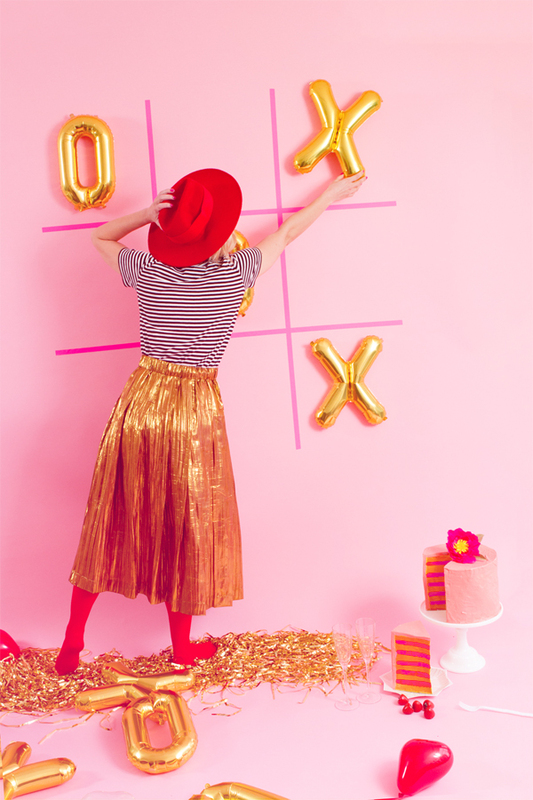 Kids and grown-ups alike are going to love this Giant Balloon Tic Tac Toe game! This cute Heart on a String Game is a ton of fun! Customize the game to your own style by adding sweet love notes to the hearts or including a yummy treat or novelty toy as well! 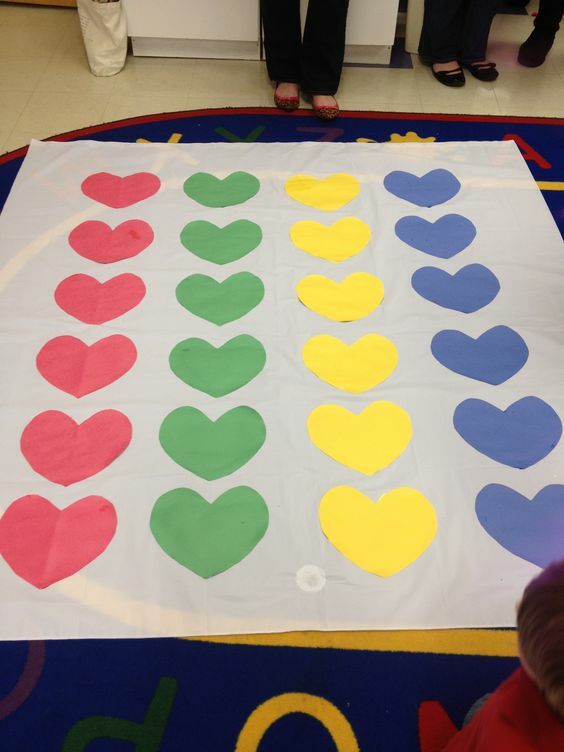 Use an inexpensive white shower curtain liner to create this adorable Valentine’s Day Twister game! This Lift-the-Flaps game is great for preschoolers and younger children or adapt it for older kids by adding trivia questions or physical challenges underneath the flaps! 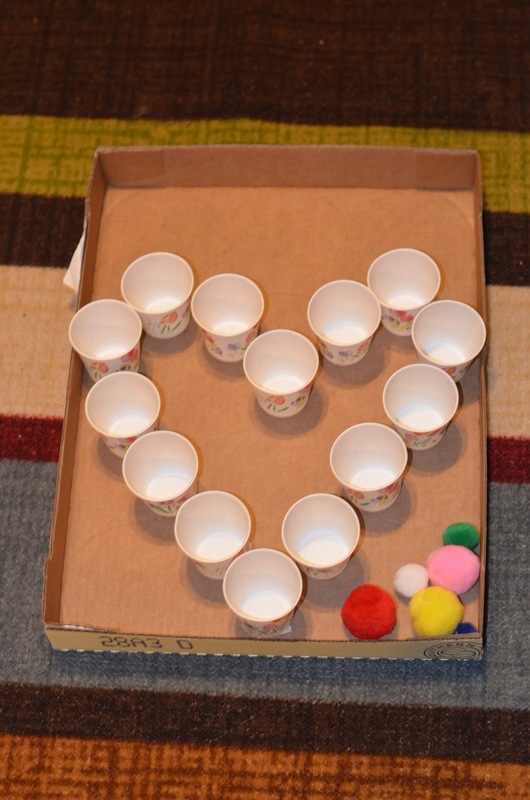 All it takes are a few Dixie cups and some pom poms to create this cute Valentine Heart Toss game! Cupid’s Cups is just one of the many fun Valentines Day games you can find on Play. Party. Plan.! 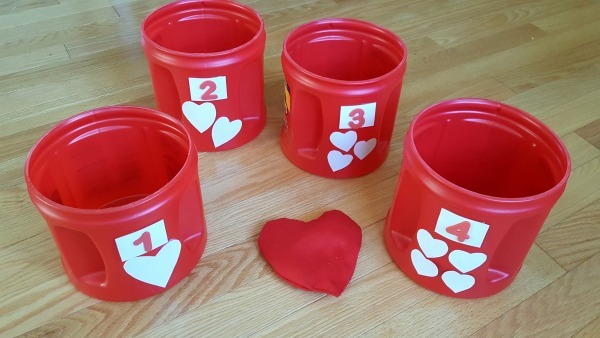 Use recycled containers to create your very own Valentine Bean Bag Game! If you’re looking for even MORE Valentine’s Day games and activities, check out our MEGA game bundle!